Writing Herstory – Women you should know. An author on history and writing. No doubt about it, Victorian valentines are pretty to look at. But these cards weren’t mere frippery – they were big business. At the center of the Victorian valentine industry was Esther Howland, the so-called mother of the American valentine. Esther was born in 1828 in Worcester, Massachusetts. Her father owned a stationary store. This proximity to paper sparked Esther’s wildly successful business idea. Legend has it that on an otherwise unremarkable day in 1849, Esther was asked to stock some frilly English valentines that her father had imported. She reportedly thought that “it would be no great task to make even prettier ones…”. So she began to do just that. In every version of the story, Esther used scrap paper to make her first valentines. And in every version of the story, her valentines were met with immediate, uproarious success. Esther’s valentines weren’t just pretty — they represented a hard-core business operation. Esther started her business in 1849, at just over 20 years old. According to professor Barry Shank, “Howland found a way to convey complexity and layering using colors and textures that could be assembled by relatively unskilled manual laborers, almost all of whom were women.” Howland did grow her business to employ dozens of women, turning thousands of dollars of profit each year. Some accounts peg her business income at $100,000 annually. It may have been Esther, not Ford, who invented the production line. Esther Howland cards. Photo from Paige Memorial Library. Using a production line was not Esther’s only business innovation. She made a point of creating cards for all budgets, from a simple 5-cent card to complex lace ring-boxes that sold for $50 or more. She provided vendors with over a hundred verses that could be inserted into the cards for a more personal feel. She even was an early advocate of DIY, as she sold valentine kits for women who wanted to assemble the pieces at home. Esther continued to run her successful business from 1849 until 1881, when she sold the company to George C. Whitney. This company became one of the largest greeting card companies in the world. Esther Howland was a woman with remarkable business acumen. She was able to use the images of domesticity and female prettiness to expand her paper empire. This is what strikes me as a central image to focus her story upon, then: the combination of frills and frippery with the sharp-as-steel business mind underneath. Featured Image from Wikipedia, originally sourced from http://www.americanantiquarian.org/. CC license, no changes made. America Comes Alive: Esther Howland (1828-1904), First in America to Mass Produce Valentines. Slender leaves spiral across a golden background. Red and white butterflies seem to hover above plump purple eggplants. A grasshopper climbs up a pastel stem. These gorgeous botanical paintings are the work of Shin Saimdang, a Korean artist who elevated images of insects and grass into expressive, whirling scenes. Legend has it that when Shin painted a grasshopper, chickens would peck at the canvas. Her paintings were that realistic and lively. Shin In-seon was born in 1504 in Gangneung, Korea. As a budding artist, she took the pen name Saimdang. “Saimdang” is a mix of three Chinese characters: Sa for teacher, Im for the legendary mother of King Wen, named Tairen, and Dang for lady. This name would serve her well: she is remembered as a mother, a teacher, and a great woman artist. Shin’s realistic insects. From here. Familial relationships were central to Shin, and make up an important part of how she is remembered. She is best known for her role as mother to a famous scholar-poet, the reknowned Joseon Dynasty writer Yulgok. She took an active role in educating her children, and Yulgok’s success is credited to her parenting. Even though Shin died when Yulgok was 15 years old, her influence may have helped him take first place in the nine civil service exams he took, which set him on the path to greatness. Today, Shin Saimdang is honored with an award in her name which is essentially a “mother of the year” trophy. Shin’s relationship with her children mirrored her relationship with her own parents. In a restrictive environment for women, Shin was able to thrive due to her own strong education and familial background. The eldest of five daughters, her parents and grandparents educated her as though she were a boy, devoting time and resources to her accomplishment. She was a talented student of calligraphy, drawing, writing, and painting. Shin Saimdang was a poet as well as a painter. She reflects on her relationship with her own parents in the poem below. I can see her painting style reflected in this poem as well. The faded, obscured green mountain is an image of loneliness that contrasts with the bright greens of her paintings. I look back at my home, and for a moment take hope. Shin was a scholar-painter whose work focused primarily on painting the “Four Gentlemen”—the pine tree, bamboo, plum tree, and orchid—as well as other natural subjects. The “Four Gentlemen” represent the four seasons, as well as the four Confucianist junzi (virtuous examples). So Shin was not just painting bugs and leaves: she was painting the natural world in a symbolic relationship to time and philosophy. Today, Shin Saimdang is honored with a portrait on Korea’s 5,000 and 50,000 won currency notes. There is some controversy about her prestige: Korean women’s rights activists protested this honor, claiming that there are other women in Korean history that deserve to be honored, and not just for their traditional roles as mothers. Controversy aside, Shin Saimdang was not only an accomplished wife and mother, but a visionary artist in her own right. I love imagining illustrated books about artists. I can imagine Shin’s story told visually with a play on her style: lots of gold, green, and playful insects on the page. Narrative nonfiction conveys information with a strong story line. Because the writer is telling a story, you need to immerse readers in the world of your subject. A great way to make readers feel a connection with a nonfiction subject is to engage their imagination through the senses. I’ve made it a goal to write descriptions that use each of the five senses in the first few pages of each manuscript. Using onomatopoeia can be an effective way to get your readers really listening. For picture books, onomatopoeia can also make the book a fun read-aloud, always a selling point. What I’d call “direct” onomatopoeia uses the words as stylized sounds in the text, like interjections. Each word in is bold and stylized within the text. Melba’s story is about music. These highlighted sounds set up the theme. These sound words are also innovative. I love “ping-pang” for the jazzy noise that a piano makes. Especially when writing for children, let your imagination run wild – there’s no reason to stick to conventional descriptions! You don’t have to highlight your use of onomatopoeia in order to use strong sound words within a text. It can be just as engaging to use onomatopoeia within your descriptions of a scene. Writing for kids often limits your word count, so choose each word carefully. Why use a bland verb when an onomatopoeic one will do? Case study: Six Dots: A Story of Young Louis Braille by Jen Bryant and Boris Kulikov. Knopf Books for Young Readers, 2016. Knopf Books for Young Readers. CDC Books. Bryant makes so many great choices in these early lines that make the story come alive. First, there’s the expressive sound of the French “Loo-WEE!” Young readers get the sense that Louis is from a very specific place and time. The neighbors “clucking” and “whispering” makes the story come to life on the first page. Setting up the conflict right away, we hear how young Louis will have to overcome the obstacle of doubt. These words also give the adult reader a clue on how to “act” reading the villagers’ part. All that adds up to immediately throwing the reader into Louis’ world, conflict and all. Well-chosen dialogue can also give a sense of auditory detail, setting, and even conflict. Dialogue can be difficult in historical nonfiction, as the writer needs to decide whether to use invented dialogue or the subject’s own words. Still, carefully-chosen words will help set the scene. 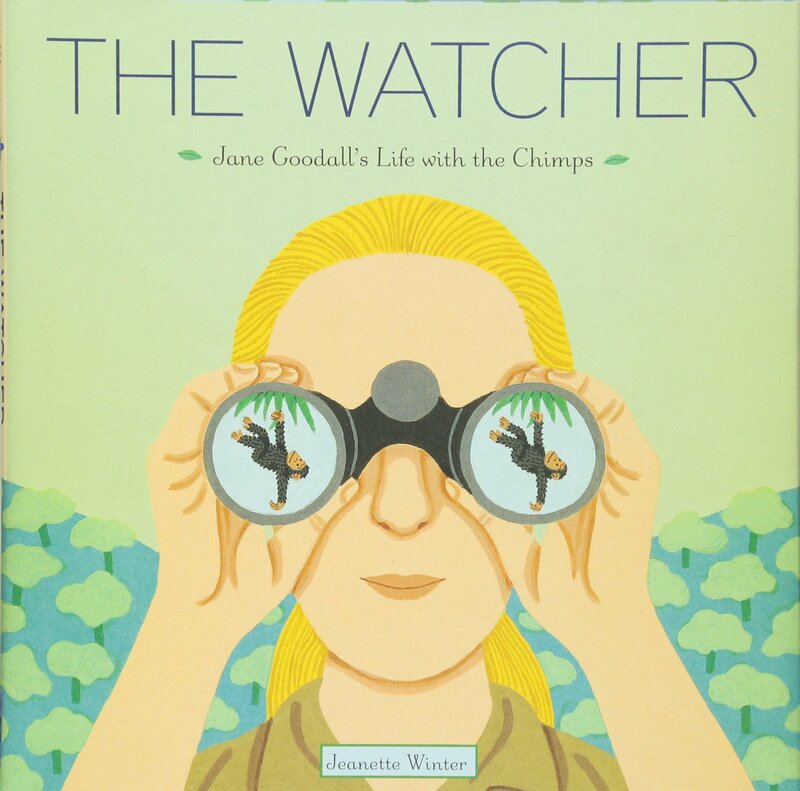 Case study: The Watcher: Jane Goodall’s Life with the Chimps by Jeanette Winter. Schwartz & Wade, 2011. What’s great about this dialogue is that it creates an immediate sense of place and conflict: Jane is missing, and someone has gone to find her. This is a scenario that is probably familiar to most young readers, making them connect with the story right away. Dialogue is an opportunity to make that connection with the reader. Of course, with the conflict over invented dialogue (blog post coming soon! ), writers will have to choose how to remain in the nonfiction story while also adding this narrative component. Nothing fancy: just describing a sound to add to a sense of place. Well, there’s something fancy about it. 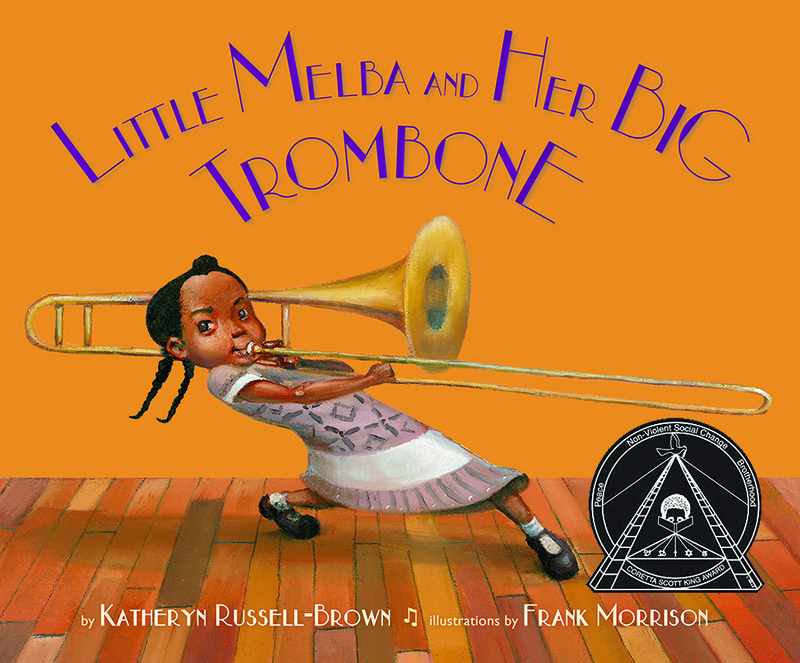 The best writers of children’s nonfiction know how to describe sound in a way that is relatable, but surprising. Consider using unusual metaphors, bold word choices, and alliteration. Case study: The Great Kapok Tree: A Tale of the Amazon Rain Forest by Lynne Cherry. HMH Books for Young Readers, 1990. This book is an enduring nonfiction favorite, and it’s clear why. These descriptions thrust the reader into a world that they may have no experience with, but that is easy to imagine through Cherry’s vivid descriptions. Placing sound at the beginning of the book gives the reader a window into a different world. During the writing process, I try to refer to each of the senses in early pages. Sometimes these descriptions are dropped from the draft, but more often then not, they add detail that can absorb the reader into wanting to learn about a nonfiction topic. Sometimes, sound can bring the reader to a different time, as with the “clip-clop” of horses in a nineteenth century village. Sound can introduce conflict: why are we whispering? Who’s there? At other times, sound can highlight the theme, as with the life of a famous musician. In any case, narrative nonfiction for children can benefit from the intentional, early engaging of the senses through sound. Women did not have the right to vote in the Revolutionary United States, but that doesn’t mean they were politically inactive. American women engaged in the politics of the day through politicizing traditionally female spaces, such as domestic clothing production. In order to prevent dependence on British imports and defy British imperial taxation, revolutionary women made homespun clothing. The wearing of “homespun” became a symbol of the American Revolution. Homespun military uniforms clothed the revolutionaries. In this way, women became visible in the fight for independence. Even fierce first Lady and women’s rights activist Abigail Adams made homespun clothing. Spinning in an 18th-century home. Public Domain. Amelia Bloomer edited the first American newspaper for women, called The Lily. She was the paper’s sole editor and owner. The heading of the paper ran “Devoted to the Interests of Woman.” Amelia underscored this in her first editorial, where she wrote that “It is woman that speaks through The Lily.“ And speak she would – Amelia’s editorial (and sartorial!) choices are still with us today. Like many female activists of her time, Amelia was involved in the temperance movement before shifting her focus to women’s rights. She was frustrated by what she saw as women’s limited role in temperance societies. She lamented that women “could attend meetings and listen to the eloquence and arguments of men, and they could pay their money towards the support of temperance lecturers, but such a thing as their having anything to say or do further than this was not thought of.” Through Amelia’s paper, she made sure that women had more to say and do – and wear. Amelia Bloomer in the “short dress” that would come to bear her name. National Park Service. In the 1850’s, women’s dress reform was an activist issue, though an oft-ridiculed one. Women’s rights activists like Amelia Bloomer saw women’s dress as restrictive and degrading. 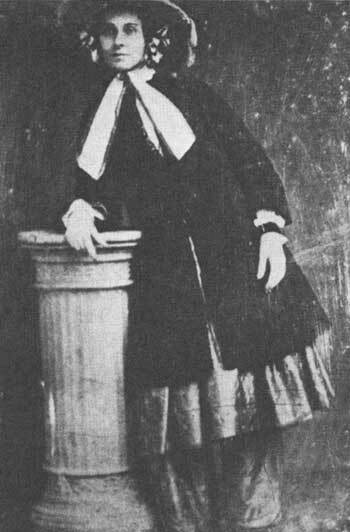 Feminists in Seneca Falls, like Elizabeth Smith Miller and Elizabeth Cady Stanton, began wearing the “short dress” costume that they felt afforded them more freedom. After their example, Amelia published an engraving of herself wearing the outfit in The Lily. The “short dress” was subject to immediate and widespread ridicule. But women were interested, and subscriptions to The Lily increased. Sensing the importance of dress reform, Amelia Bloomer would wear the outfit that would come to be named after her exclusively for the next eight years. 1850’s caricature of women wearing bloomers. This cartoon associates the “short dress” with something that was considered equally unfeminine: smoking. Wikimedia Commons. Ultimately, many feminists did give up wearing “Bloomers” in order to focus on women’s rights issues and be taken seriously. Amelia Bloomer herself stopped wearing the outfit and wrote: “There were other questions of greater importance than the length of a skirt under discussion at the time, and I felt my influence would be greater in the dress ordinarily worn by women than in the one I was wearing.” This is a historical case study where what you wore mattered, unfortunately, more than what you said. Charlotte Marsh poses before a crowd assembled in Hyde Park. Museum of London. 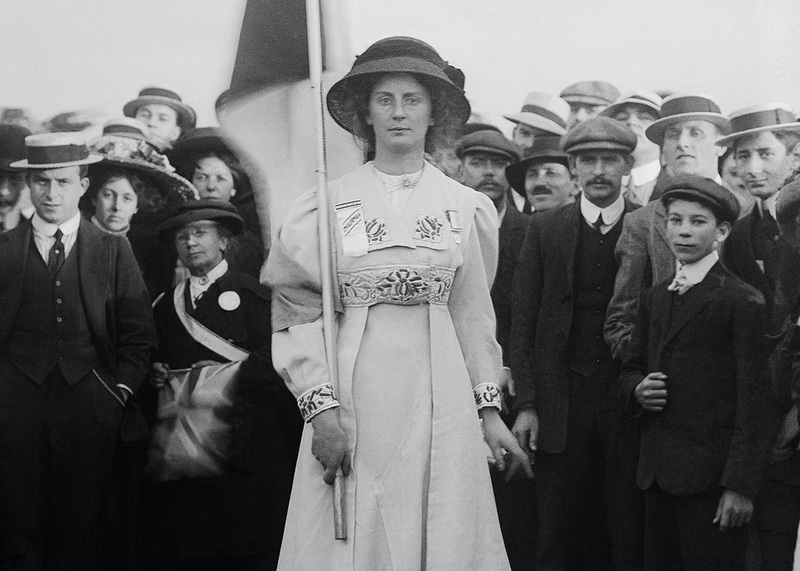 In the above picture, Suffragette leader Charlotte Marsh wears white, symbolizing the women’s suffrage movement. She was the Colour Bearer for the Suffragette procession on June 18, 1910 in support of the Conciliation Bill. She also wore on her chest her hunger-strike medal, which commemorated her having endured force-feeding for three months while imprisoned. Women in white dresses came to be a visible sign of the movement. White dresses spread across the globe. In Australia, purple, green, and white symbolized the women’s movement. The American suffrage movement also combined these colors. These colors were incorporated into jewelry, sashes, hats, and other wearable symbols of women’s fight for the vote. Portrait badge of Emmeline Pankhurts, suffragette. Wikimedia Commons. These are but three short examples from a limited scope of women’s history — women’s clothing has been politicized for centuries. Activists who combine what they say with what they wear are working in a rich tradition of women’s protest. “Amelia Bloomer,” National Parks Service. “Amelia Bloomer,” National Women’s History Museum. “Amelia Bloomer: Publisher and Advocate for Women’s Rights.” Social Welfare Library. “Purple, Green, and White: An Australian History.” Museum of Applied Arts and Sciences. Hermanson, Tove. “Knitting as Dissent: Female Resistance in America Since the Revolutionary War.” Textile Society of America. DigitalCommons@Universityof Nebraska, 2012. Skemp, Sheila L. “Woman and Politics in the Era of the America Revolution.” Oxford Research Encyclopedia of American History, June 2016. As quoted in Social Welfare Library. LaCroix, Allison. “The National Women’s Party and the Meaning Behind Their Purple, White, and Gold Textiles.” National Women’s Party. Have you ever found source material that is SO GOOD that you actually can’t believe it? A researcher’s life isn’t easy, so whenever I find material that’s rich and detailed, I start shaking with excitement. That’s how I felt reading Janet Scudder’s book, Modeling My Life. In 1893, American sculptor Loredo Taft was working hard on a commission for the World’s Fair in Chicago, also known as the World’s Columbian Exposition. Fearful that he would not finish his sculptures in time, he asked the chief architect, Daniel Burnham, if he might hire women to assist his work. Though Taft had women working in his studio, women working on a piece of the World’s Fair exposition was unprecedented. The reaction was one of joy. Loredo Taft in his studio. Public Domain. Women and men working on Taft’s section of the World’s Columbian Exposition. Chicago History Museum Images. At the fair, Janet saw Frederick W. MacMonnie’s fountain “the Barge of State.” She decided to go to Paris to work for him, and became the first woman he employed. The remainder of her life, she traveled between Italy, France, and the United States while doing steady work as a sculptor. One of her pieces is below. Bas-relief of Mildred Barnes by Janet Scudder. Wikimedia Commons. Scudder, Janet. Modeling my life. Harcourt, Brace, 1925. The full text is available here. In 1896, hats with feathers were all the rage. But it was a different type of rage – rage over the slaughter of the birds that provided the feathers – that motivated Harriet Hemenway. In 1896, the Boston social luminary read an article detailing the violent aftermath of a plume hunter’s rampage. Harriet was disturbed by the account. That day, over a cup of tea, she set to work ending the feather trade. Harriet had always been an independent woman with a mind of her own. She was one of the group of notoriously independent Boston women who used their social circles to advocate for change. She was educated. She entertained Booker T. Washington as a houseguest when he could not find lodging for a black man elsewhere in Boston. She was known for setting out on nature hikes in unfashionable white sneakers. She publicly announced her pregnancy at a time when these declarations were shocking. She was also terribly fond of chocolate and tea. So, with a goal in mind, nothing could stand in her way. Taking on the plume industry was a difficult task, but environmentally necessary. An estimated 5 million birds were killed each year for fashion, so many that there were fewer than 5,000 nesting egrets in the United States. Egrets weren’t the only species under threat. As many as 50 species of birds were being slaughtered for their feathers. The industry made millions of dollars – the going “feather” rate in the 1880s was $20 per ounce – $510 in today’s dollars. Feathers were more valuable than gold. Women wore hats not only adorned with feathers, but with the entire bird. Audubon’s drawing of a Great American Shrike, 1812. From here. Harriet did her work over tea. She used tea parties to organize women to boycott the feathery fashions. Harriet and her cousin, Minna B. Hall, convinced over 900 women “to work to discourage the buying or wearing of feathers and to otherwise further the protection of native birds.” Using the solidarity of Boston women, Minna and Harriet tried their darnedest to make feather hats uncool. The next year, they started the Massachusetts Audubon Society, making sure to involve some of the foremost male conservationists in the country – a move which launched the society into the national consciousness. Massachusetts outlawed trade in wild-bird feathers in 1897. The combination of political and social pressure led to the Lacey Act of 1900, which prohibited interstate shipment of animals killed in violation of state laws. Combined with strong local laws against wild bird slaughter, these acts severely weakened the bird trade. In 1913, the victory of the Migratory Bird Act ensured safety for many of these endangered birds. Through it all, Harriet continued to persuade and educate, over tea. Harriet Hemenway, painted by John Singer Sargent. Public Domain. As a writer of biographies, I always look for a person’s “core belief” in order to write a story that is true to their life. Harriet’s core belief may have been something like, “no obstacle is insurmountable.” She did amazing work using the social tools available to her in turn-of-the-century Boston. She never gave up these causes. She lived to be 103 years old, and devoted the final decades of her life to activism with as much energy as she had in her youth. Mitchell, John H. “The Mothers of Conservation.” Sanctuary: The Journal of the Massachusetts Audobon Society. Jan/Feb, 1996. Mitchell, John H. “The Mothers of Conservation.” p. 4.